In the movie It’s Complicated, Meryl Streep and Alec Baldwin play such a couple (Jane and Jake Adler), who find themselves at a hotel bar while in New York for their son’s graduation. One drink leads to two leads to dancing and then to the rest of this terrific rom-com (if you haven’t seen it, Redbox it now). But it’s the dancing that really struck me. 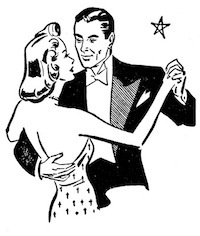 If you’ve ever watched a long-married couple dance, you’ll see them just kind of melt into a rhythm and flow that’s indicative not just of their fancy (or not-so-fancy) footwork — it’s also indicative of a life lived together. It’s a familiarity that can’t be taught in dance class; an intimacy that comes from this not being their first dance; a certainty that’s not just romantic — it’s real. And remembered. Watching Jane and Jake dance, you can see the years fall away (even if it’s just for a while). She fits just so into his arms, he holds her hand the same way he did at the beginning, and for a few minutes — and a few minutes more dancing to Wouldn’t It Be Nice? later in the movie — they’ve recaptured a piece of their life together. Of course, marriage isn’t just about dancing — it’s also about finding your center, learning to balance, and continuing to pedal so you don’t fall off. Quite simply, one hell of a ride.